All authors have reviewed the manuscript and approved its submission to the European Journal of Plant Pathology. The manuscript has not been submitted elsewhere. Mexico is the center of origin for corn (Zea mays L.) domestication (Doebley 2004), and is currently one of the five main corn-producing countries in the world (FAO 2012). In Mexico, corn production can be divided into two major categories: commercial production usually practiced by large and medium farmers using modern cultivars and agrochemicals, and traditional production practiced by small and subsistence farmers using no or limited technology (Mejía and Peel 2009). In the Mexican highlands of Puebla, located over 2300 m above sea level (a.s.l), small agricultural communities (fewer than two hectares per farmer), and small ‘ejidos’ (between two and ten hectares per farmer) use races of native corn that are adapted to the environmental conditions prevalent at high altitudes (Perales and Golicher 2014). Native corn possesses unique genotypes that have been maintained due to selection in local environments and seed interchanges and more than fifty landraces are available to growers in Mexico (Serratos 2009). Diseases affecting these native corn varieties grown by subsistence farmers have an important effect on their livelihoods. Maize bushy stunt (MBS) disease was first detected in Mexico in 1955 (Maramorosch 1955); however, it was not until 1978 that it was determined to be caused by a phytoplasma (Bascope 1977; Nault 1980; Harrison 1996). Further studies identified the phytoplasma associated with MBS as a ‘Candidatus Phytoplasma asteris’-related strain belonging to the 16SrI-B subgroup (Lee et al. 1993, 2004). MBS phytoplasma (MBSP) was also detected in Peru (Nault et al. 1979; Hodgetts et al. 2009), Nicaragua (Hruska et al. 1996), Costa Rica (Harrison et al. 1996), Belize (Henríquez et al. 1999), Brazil (Bedendo et al. 1997), and Colombia (Alvarez et al. 2014). In all countries MBSP was identified as a member of the 16SrI-B subgroup but was never reported as affecting a native variety. In commercial corn cultivars, MBS symptoms include chlorotic stripes, reddening and/or yellowing of leaves, stunting, and the adoption of a bushy phenotype (Nault 1980, 1983). It is therefore important to describe the symptoms and understand the geographic distribution of MBS in native corn in order to differentiate it from related diseases and prevent its spread to other crops via insect vectors (Weintraub and Beanland 2006). Further, disease surveillance is crucial to support the farmers who live in remote, high altitude communities in order to provide timely, accurate information on the presence and taxonomy of MBSP in their crops. Phytoplasma taxonomy is generally based on the comparison of the 16S rRNA-encoding gene sequences (IRPCM 2004). Recently, other ribosomal and protein-encoding genes have been used to improve phytoplasma strain differentiation and/or to develop diagnostic methods (Lee et al. 2010; Davis et al. 2013; Dumonceaux et al. 2014). The Cpn60-encoding gene has been successfully used as a marker for phytoplasma detection and differentiation (Mitrović et al. 2011; Sugawara et al. 2012; Alvarez et al. 2014), and an approximately 550 bp portion of this gene, known as the chaperonin 60 universal target (cpn60UT) (Goh et al. 1996) can be universally accessed and used to differentiate phytoplasmas (Pérez-López et al. 2014; Dumonceaux et al. 2014). This study is the result of a large survey of native corn-producing communities located in the ‘Sierra norte de Puebla’ in Mexico, aimed at detecting and identifying phytoplasma associated with MBS in native corn. Corn plants expressing phytoplasma disease-like symptoms were sampled and analyzed using the 16S rRNA gene and cpn60 UT sequences as markers. This study is the first molecular survey of corn plants affected by MBSP in Mexico, identifying two strains, MBS Puebla and MBS Veracruz. The long term relationship between MBSP and corn plants is discussed. Two surveys were conducted during the growing season of 2013–2014 in three agricultural communities in the states of Puebla and Veracruz, Mexico (Table 1). The surveys were conducted during the months of July and November 2014 (4 and 8 months after planting). At four months plants were completely developed but without cobs, and at 8 months the plants showed completely developed cobs. Whole plants of native corn expressing phytoplasma disease-like symptoms along with asymptomatic plants (Table 1) were collected and placed in plastic bags for transportation. Once in the laboratory, plants were stored at 4 °C until DNA extraction. Plant tissue used to extract DNA from each sample was selected based on symptom expression (Table 2). For field collected samples and germinated corn plants, DNA was extracted from 0.3 g of tissue through a modified CTAB method (Murray and Thompson 1980). Briefly, the tissues were immersed in liquid nitrogen for 30 s, macerated with a mortar and pestle in 2.5 ml of extraction buffer (100 mM Tris-base pH 8, 150 mM NaCl, 25 mM EDTA, 8 mM polyvinylpyrrolidone, 50 mM cetyltrimethyl ammonium bromide and 0.2 % β-mercaptoethanol) and incubated for 30 min at 65 °C. After centrifugation at 14 000×g for 10 min, the supernatants (~900 μl) were transferred into clean Eppendorf tubes and 900 μl of chloroform: isoamyl alcohol (24:1, v: v) was added. The tubes were then vortexed and centrifuged at 14 000×g for 5 min. The aqueous phases (~800 μl) were transferred into clean 1.5 ml microcentrifuge tubes with 500 μl of isopropanol to precipitate the DNA and incubated for 1 h at −20 °C. After centrifugation at 14 000 g for 5 min and removal of the supernatant, DNA was washed twice with 70 % ethanol, dried and resuspended in 30 μl of sterile water. DNA was diluted 1/10 in 10 mM Tris-HCl (pH 8.5), and used as a template for PCR amplification of the 16S rRNA-encoding gene using phytoplasma universal primers P1/Tint (Smart et al. 1996) or R16F2n/R16R2 (Gundersen and Lee 1996), and amplification of the cpn60UT sequence with primers H279p/H280p:D0317/D0318 (1:7 ratio) (Dumonceaux et al. 2014) following the protocol described by authors. All amplifications were performed in 50 μl mixtures containing 1X Taq polymerase buffer (Invitrogen, Burlington, Canada), 500 nM dNTP, 400 nM of each primer, 2 μl of diluted DNA (about 10 ng), and 2.5 mM MgCl2. Phytoplasma DNA was revealed by the presence of 1600, 1200 or 604 bp amplicons, depending on the primers and PCR conditions used, when observed in an ethidium bromide-stained 1 % agarose gel using an ultraviolet transiluminator set at 365 nm (AIML 26, Alpha Innotech Corp., San Leandro, CA, USA). Amplicons were purified using QIAquick® PCR Purification Kit (QIAGEN, Toronto, Canada) and directly sequenced using the amplification primers. The 16S rRNA-encoding genes and cpn60 UT amplified from samples NMBSP-P144 and NMBSP-V41 were ligated into the vector pGEM-T Easy (Promega, Madison, WI USA) following the manufacturer’s recommendations, transformed into chemically competent E. coli TOP10 (Invitrogen, ON, Canada), and sequenced using primers T7/SP6. The 16S rRNA-encoding gene and cpn60 UT sequences generated in this study were assembled using the Staden package (Bonfield and Whitwham 2010), and compared with reference sequences from GenBank using BLAST (http://www.ncbi.nlm.nih.gov). Phylogenetic analysis was conducted using the Maximum Parsimony method with MEGA v6.0 (Tamura et al. 2013), and bootstrapping 1000 times to estimate stability. Acholeplasma laidlawii strain PG-8 A (U14905) was used as outgroup to root the tree. RFLP patterns obtained after digesting the 16S rRNA gene amplicons amplified from four of the positive samples analyzed in this study with endonucleases EcoRI, HinfI, BfaI and HhaI (Thermo Scientific, Canada), were compared with the RFLP profile of ‘Ca.P. asteris’ – related strain previously identified by our group. Reactions were incubated at 37 °C (Thermo Scientific, ON, Canada), and were observed after electrophoresis using 4 % acrylamide gels (Invitrogen, ON, Canada) stained with GelRed (Invitrogen, ON, Canada). For confirmation of classification, the purified amplicon of one of the positive samples analyzed in this study was digested in single reactions with AluI, BfaI, BstUI, EcoRI, HaeIII, HhaI, HinfI,and HpaII, at 37 °C, and MseI and Tsp509I at 68 °C (Thermo Scientific, ON, Canada). After digestion, the samples were observed after electrophoresis using 4 % UltraPure ™Agarose 1000 gel (Invitrogen, ON, Canada), and staining with ethidium bromide. The consensus of the two different cpn60 UT sequences obtained in this study was aligned with twenty publically available Cpn60-encoding gene sequences from ‘Ca.P. asteris’ – related strains using ClustalW (Thompson et al. 1994), and trimmed using the Staden package (Bonfield and Whitwham 2010) to the 552 bp cpn60 universal target (Dumonceaux et al. 2014). The single nucleotide polymorphisms (SNP) present were noted manually. During the first survey in July 2014, native corn plants expressing symptoms of small leaves, reddish leaves and/or leaves with red midribs, leaves with yellow or chlorotic stripes, stunting, atrophied inflorescence, and/or atrophied shoots were observed (Fig. 1). During the second survey, in November 2014, plants with undeveloped cobs and cobs expressing phytoplasma-disease like symptoms such as partial cob filling, small malformed kernels, and high amount of silk or small cobs were observed (Fig. 1). The ratio of symptomatic/total plants collected per symptom as well as the range of symptoms detected differed between the Puebla and Veracruz collection sites (Table 2). A 16S-23S rRNA fragment amplified with P1/Tint was obtained with 33 samples collected in Veracruz and 35 samples collected in Puebla. The expected band of 1.2 kb was observed with twenty samples collected in Veracruz, and three samples collected in Puebla. To confirm the results, the 10 % of the symptomatic plants that were negative with primers P1/Tint were also negative with primers R16F2n/R16R2. Amplicons corresponding to the cpn60 UT (552 bp) were observed for the 23 samples that were positive with primers R16F2n/R16R2. 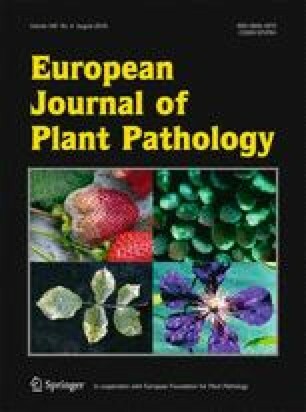 No phytoplasma DNA was detected from asymptomatic plants. The 16S rRNA and the cpn60 UT sequences of the 20 positive samples collected in Veracruz, and one sample collected in Puebla were 100 % identical, while the other two samples collected in Puebla shared only 99 % nucleotide identity with the others. All 23 sequences shared 99 % identity based on the 16S rRNA-encoding sequence with the strain MBS Colombia (MBS-Col) (Genbank accession no. HQ530152), and the strain MBS from Mexico (MBS-Mex) (GenBank accession no. AY265208). The cpn60 UT sequences of the 20 positive samples collected in Veracruz and one of the positive samples collected in Puebla were 100 % identical to the strain MBS-Col (GenBank accession no. AB599712), while the remaining two samples were only 99 % identical to the strain MBS-Col based on cpn60 UT sequences. The cpn60 UT sequences were also deposited into GenBank for strain MBS-Pueb (GenBank accession no. KT444672) and MBS-Ver (GenBank accession no. KT444673). The phylogenetic tree obtained by Maximum Parsimony analysis of the 16S rRNA and cpn60 UT sequences of MBS-Pueb and MBS-Ver showed that the phytoplasmas detected branched with the ‘Ca.P. asteris’ - related strains from subgroup 16SrI-B and is consistent with the nucleotide similarities observed (Fig. 2). RFLP analysis of PCR product primed by R16F2n/R16R2 with EcoRI, HinfI, BfaI and HhaI indicated that samples MBS-P144, MBS-P167, MBS-V41, and MBS-V44 were identical to each other (Not shown). All reference strains showed the same restriction profile with EcoRI, as expected (Not shown), and digestion with HhaI differentiated the MBS samples from the strain MP reported as a closely related member of 16SrI-F subgroup (Pérez-López et al. 2013). The RFLP profiles of the R16F2n/R16R2- primed amplicon from MBS-P144 with nine of seventeen endonucleases used in the phytoplasma classification scheme and the restriction enzyme Tsp509I were identical to the profile expected for a member of the subgroup 16SrI-B (Not shown) (Wei et al. 2007). SNP analysis identified differences among the cpn60 UT sequences obtained in this study and the twenty ‘Ca.P. asteris’– related strains used as reference. The cpn60 UT amplified from strains MBS-Pueb and MBS-Ver showed a differential SNP pattern. The SNP based on cpn60 UT confirmed the detection of two different strains between the symptomatic native corn plants collected in this study (Table 3). Our work was part of a large survey of native corn-producing communities located in the ‘Sierra norte de Puebla’ in Mexico, aiming at detecting and identifying phytoplasma in native corn. Symptomatology and molecular tools revealed the presence of two strains of phytoplasma in native corn. We observed a high number of false positives detected with primers P1/Tint. These primers have been used many times to detect phytoplasmas with good results (Dumonceaux et al. 2014; Torres-Moreno et al. 2013); however non-specific amplification has previously been a problem with universal primers developed to detect bacteria (Weisburg et al. 1991). For this reason, only the results obtained with the 16S rRNA-encoding gene (R16F2n/R16R2) and cpn60 UT sequences will be discussed. Phytoplasma DNA was detected in leaves, stem and shoots, and also in the cobs of the symptomatic corn plants collected. The detection of phytoplasma from symptomatic cobs is not surprising. Many other authors have reported the detection of phytoplasma in plant organs related to reproduction (Nipah et al. 2007; Olivier et al. 2010). Results of 16S rRNA PCR tests showed that the incidence of phytoplasma in native corn was higher in Veracruz (20 positive out of 33 tested) than in Puebla (3 positive out of 35). We observed better management in fields located in Puebla compared to Veracruz with a lower amount of weeds in corn fields (not shown). This suggests that studies of the role of weeds as a reservoir of phytoplasmas for native corn varieties may be important. Although other hosts are certainly possible, one of the most important and prevalent weeds in Veracruz and Puebla are plants from the genus Amaranthus spp. Samples that tested positive with the 16S primers also tested positive with the cpn60 UT primers. The use of protein-encoding genes as part of the scheme of identification and classification of phytoplasmas has been suggested (Davis et al. 2013). The groEL gene has been used to differentiate ‘Ca.P. asteris’– related strains (Mitrović et al. 2011; Alvarez et al. 2013), and as target to develop diagnostic methods (Sugawara et al. 2012). In our study, 16S and cpn60 UT sequence analysis resulted in the identification of four consensus sequences representing two strains, MBS-Puebla and MBS-Veracruz, both belonging to the subgroup 16SrI-B. The 16S sequences were nearly identical and were differentiated based on their sampling location. The cpn60 UT sequences of MBS-Puebla and MBS-Veracruz belonged to two strains, in agreement with 16S PCR identification. This provides further evidence that the cpn60 UT sequence can be used as a diagnostic target, and as an additional marker to differentiate phytoplasma strains. Our results confirmed the association of two phytoplasma strains, named MBS-Puebla and MBS-Veracruz, belonging to ‘Ca.P. asteris’ species, and members of the subgroup 16SrI-B, with native corn in high elevation communities of Puebla and Veracruz in southeast Mexico. To our knowledge, this is the first molecular confirmation of the presence of MBSP, and the first report of the symptomatology of MBSP-infected native corn in Mexico. The idea of an evolutionary relationship between MBSP and corn plants came from the study of the genus Dalbulus and its relationship with corn plants (Nault and Delong 1980). Southern Mexico has been considered the center of diversity and speciation of the genus Dalbulus, a genus that includes the reported MBSP-vectors, and is also the center of evolution and domestication of maize from teosinte (Zea mays ssp. Parviglumis) (Nault and Delong 1980; Doebley 2004). The ‘corn leafhopper’ (Dalbulus maidis), and the ‘Mexican corn leafhopper’ (Dalbulus elimatus), showed a natural preference for corn as a food source and a reproductive host, and a high rate of tolerance to the MBSP infection and efficient subsequent transmission (Nault and Delong 1980; Nault 1980, 1983). The relationship among corn, Dalbulus leafhoppers, and MBSP has been maintained since the detection of the disease, and reported throughout the Americas, suggesting a biological differentiation and specialization. Although more information and studies are need, our results have added evidence of the probable specialization and evolutionary relationship among the plant, vector, and the pathogenic prokaryote. Studies of the presence of Dalbulus spp. and other insect vectors in native corn, the incidence and impact of MBS in native corn, and the implications of the disease for the farmers in the highland communities of Mexico are ongoing. With this research we have established a baseline for efficient management strategies that aim to increase the productivity of farmers producing these important corn varieties. We thank the farmers from Mazapa and Las Trancas for the support and cooperation. We also thank Christine Hammond and Dana Nordin for their support in lab work, and Jennifer Town for critical review of the manuscript. Finally, we thank Dr. Robert E. Davis for his helpful advice. This work was supported by the Genomic Research and Development Initiative for the shared priority project on quarantine and invasive species. E. Pérez-López thanks CONACYT for PhD scholarship (CVU: 517835) and AAFC-Saskatoon Research and Development Centre for the laboratory space and warm welcome. FAO. 2012. FAOSTAT, production. Cited May, 8, 2015. http://faostat.fao.org/site/567/DesktopDefault.aspx?PageID=567#ancor.